Image caption Alistair Hudson has long been a champion of "useful art"
What use is art? For the boss of Manchester's two main civic galleries, art isn't just for looking at, or for buying and selling - it can improve our lives in some unexpected ways. "I want people to say, 'Oh yeah, art's actually quite useful, art's actually really important.'" Alistair Hudson has given Manchester Art Gallery and sister venue the Whitworth a new mission - to be useful. He gives some examples of how art is already utilised beyond gallery walls. Trainee dermatologists in Manchester study art in order to improve their visual skills, making them better at spotting anomalies. A lecturer at Manchester Business School teaches how important aesthetics and storytelling are for the success of big businesses like Apple. Hudson recounts how he helped curate an image for the government's new Home Office headquarters in 2005 - right down to the positions TV news crews would take up outside. "The shot you get was constructed as part of an art project, so what was beamed out on the Six O'Clock News involved sculptural elements and was aestheticised to a certain extent." He even says Russian President Vladimir Putin's right-hand man Vladislav Surkov trained in conceptual art, and there's a theory that he used those techniques to keep Putin in power. Hudson now wants to harness the power of art for the good of the city. The Whitworth was named the Museum of the Year in 2015 and Hudson has given it a new mission statement - to "use art for social change". It says: "Art should address what matters in people's lives, respond to current urgencies and propose solutions to the issues around us." The gallery will "value art for what it can do, not how much it is worth", it adds. 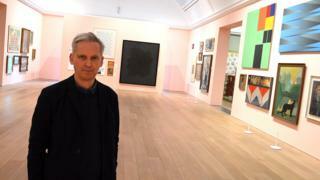 Hudson explains: "The art market serves a very small number of people in society. Museums in the modern, contemporary era - their programmes have been really driven by the contemporary art market, not necessarily by public interest." Artistic ideas, creative thinking and the transformative power of making stuff can play a big part in solving problems in areas like education, health, politics, technology, economics and the environment, he believes. Hudson took over the Manchester galleries in 2017 and has launched their new era with an exhibition at the Whitworth titled Joy For Ever: How To Use Art To Change The World And Its Price In The Market. The title and exhibition are both influenced by 19th Century thinker John Ruskin, whose ideas about creative freedom, craftsmanship and architecture went on to influence politics, education and the conservation movement. Hudson wants to update those ideas for the 21st Century. "What that means is you start to get involved in shaping and contributing to the infrastructure of society and how it works, not just creating a leisure resource or a tourist attraction. "We will still function in those terms, but ultimately this is about a much bigger role for art and arts thinking in decision-making - the kind of architecture we build, city planning, ecology, education, public housing…"
Future plans include an exhibition called Economics: The Blockbuster, which will attempt to demystify the financial world and propose alternative economic models. "And we're talking about creating a Whitworth Business School, where we will teach economics through the medium of art," he says. Platt Hall in Fallowfield, Manchester, is a third venue under Hudson's control. It was the Gallery of Costume until recently, but the costumes had to be moved because of a moth infestation. That means there's an opportunity for an overhaul. There are plans for an "experimental museum" inspired by the Victorian institutes and settlements where the working classes would learn skills and take part in creative pursuits. "I'm interested in picking up the baton of that," Hudson says. "We can't quite do the same patriarchal Victorian version of do-gooding, but what would a crowdsourced, user-generated version of that be now?" Meanwhile, funds are currently being raised to build a new park keeper's house in Whitworth Park, which may provide a model for future housing developments. The park will also gain a newly-reconstructed version of a road Ruskin once attempted to build with the help of 12 University of Oxford undergraduates, including Oscar Wilde and Hardwicke Rawnsley, who went on to found the National Trust. Hudson moved to Manchester from the Middlesbrough Institute of Modern Art (Mima), where he also put his ideas into practice. They included a regular free lunch in the gallery for people from across the city. It wasn't an artwork as such, but it harnessed the power of a gallery, he explains. "We redirected our exhibitions budget to pay for cooking for people every week. Around that table you would have gallery goers, homeless people, refugees, the police, the mayor, dementia groups... The most amazing range of people all gathered around this meal." They would meet new people and have the chance to raise issues with people in authority. "It became this moment in the week where you could start to galvanise opinion and energy that could then be directed in very positive ways," Hudson says. "But it also became the place where a lot of these have groups who didn't have a voice could have recourse to power. They could use the gravitas of the public institution in order to talk up to power - whether that's the mayor or the council. That became a very interesting way of working. It started to affect a lot of decisions." The Whitworth and Manchester Art Gallery have long done work in their communities, and the idea of "useful art" has been coming back into fashion elsewhere. But this new direction will be a test of how much difference it can make. "Art's not the answer to everything," Hudson reflects. "But I want people to be empowered by the idea that it's part of the package to determine how we have a better way of living." Why is a theatre company opening a college to teach astronomy and cooking?